It’s so easy to take it for granted, but the ability to see is truly incredible. The human eye is a breathtakingly advanced instrument – not just the ‘window to our souls’ but a self-cleaning, depth-sensing video camera that beats anything that the world’s biggest technology firms can offer. And that means it’s essential that we look after our eyes. But it’s all too easy to forget to book an eye test or keep putting it off until another day. So, if it does just one thing, World Sight Day – which takes place on Thursday 11th October – is the perfect reminder to get your eyes examined. Don’t just take our word for it: the NHS recommends that we all have our eyes checked out at least every two years. 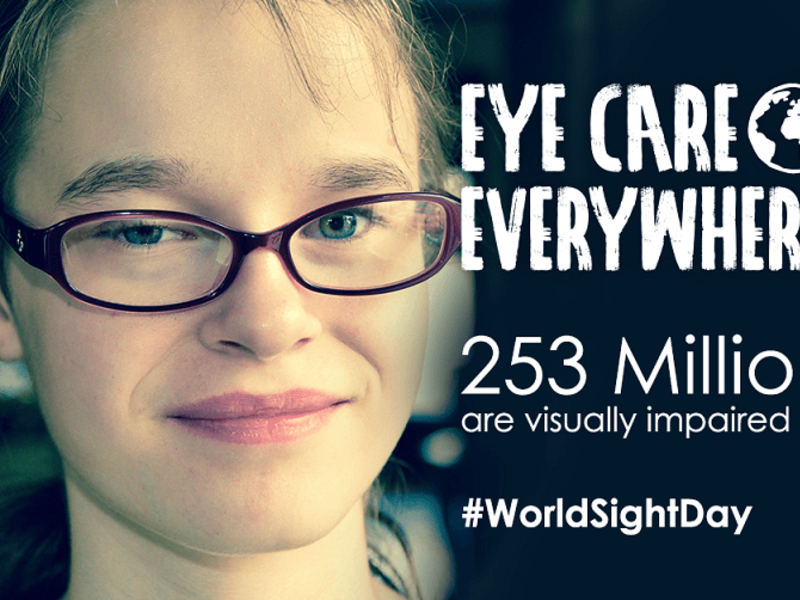 Yet World Sight Day isn’t just about eye examinations. With 253 million people around the world living with visual impairment and 36 million of those blind, its aim is to throw a spotlight on vision loss in general. For you, that can mean starting close to home: is there a relative or friend who hasn’t had an eye test for many years? Or someone you know living with diabetes that could benefit from an eye test? It’s common for your eyesight to change and deteriorate over time. But what happens when your sight loss becomes more serious? According to the RNIB, in the UK 250 people start to lose their sight each day, many of them over 50 years of age. That’s over 90,000 people every year. By 2020 the number of people with sight loss in the UK is expected to rise to over 2.25 million. From help with reading, to ensuring you maintain your independence; these organisations will listen to your concerns and help you to live life to the full. Our eye examinations typically take around 30 minutes, so if time is of the essence we suggest popping in before work or during your lunch break. Our friendly team will guide you through the test and be on hand to discuss any changes to your vision and answer your questions. What’s more, an eye test can even help to identify conditions such as diabetes and high blood pressure. To book your eye test with Leightons, call us today on 0800 40 20 20 or pop into your nearest Leightons branch. You can also use our handy online booking service to arrange your appointment.